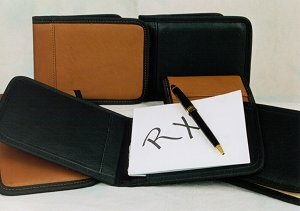 This leather or soft vinyl prescription pad holder fits all standard pad sizes, both horizontally and vertically. Excellent as a gift and can be initialed. Each wallet is individually hand crafted in the US and usually requires an extra 10 business days for delivery. For urgent orders, please call or email for our current stock. Initialed or embossed wallets can not be returned. Wallets not initialed or embossed may be returned or exchanged within 30 days of receipt of the order as long as the item is in new and unused condition. All original package contents must be included. Please phone or e-mail for a Return Authorization before returning any merchandise. We do not charge a restocking fee as long as returned items are in new and unused condition. Shipping charges are non-refundable.